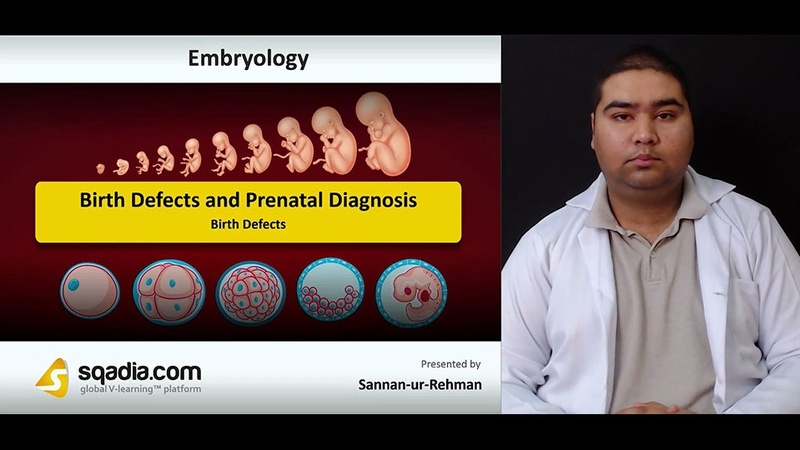 This lecture addresses the topic of Birth Defects and Prenatal Diagnosis. In section one, the educator starts off with giving an Introduction of Birth Defects and Prenatal Diagnosis. Moving forward, the educator highlights Malformations, Disruptions, and Deformations. At the end of this section, the concept of Syndrome and Association is clarified. In section two, the Causes of Birth Defects are explained. Light is shed on Environmental Causes after which the Principles of Teratology are highlighted. Following this, the educator speaks about other causes that include Infectious Agents and Hyperthermia. Section three is about the Radiation and Chemical Causes that result in Birth Defects. After elaborating on Radiation, the educator talks extensively about Chemical Agents. Moreover, Hormones are also brought under consideration by the educator in addition to other causative agents such as Endocrine Disrupters, Oral Contraceptives and Cortisone. Section four is regarding the Maternal Causes. In the start, the educator focuses on the description of Maternal Diseases. Subsequently, the topic of Nutritional Deficiencies is highlighted followed by an elaboration on Heavy Metals and Obesity as potential Maternal Causes for birth defects. At the end of this section, the educator brings to light Male Mediated Teratogenesis. The prime focus of section five is the Prenatal Diagnosis. The educator explains the concept of Ultrasonography in the beginning. Moving forward, Maternal Serum Screening and Maternal Serum Markers are elucidated. Subsequently, the topic of Amniocentesis is addressed in addition to Chorionic Villus Sampling.